In many of Louis Comfort Tiffany's works featuring landscapes, he captured nature in its many moods. Still cool waters and purple mountain's majesties awaken into beauty as the golden sun rises on the horizon of this major Louis Comfort Tiffany masterpiece currently in the possession of a private foundation. 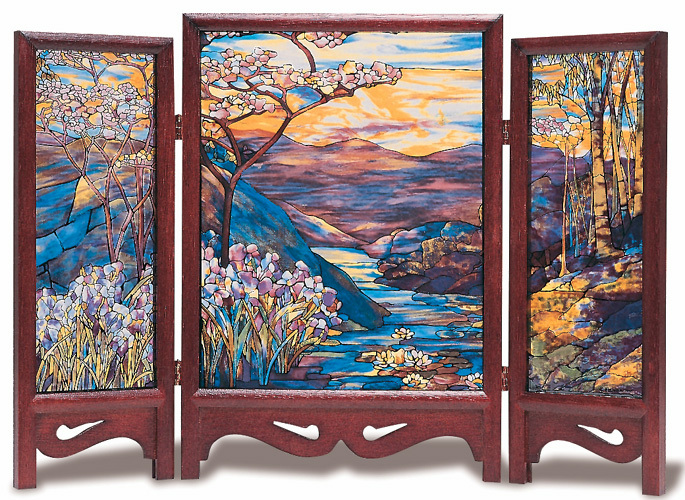 Glassmasters developed the wooden table top triptych to capture the side panels of this pastoral scene.